r.in.lidar - Creates a raster map from LAS LiDAR points using univariate statistics. The r.in.lidar module loads and bins LAS LiDAR point clouds into a new raster map. The user may choose from a variety of statistical methods in creating the new raster. Since the creation of raster maps depends on the computational region settings (extent and resolution), as default the current region extents and resolution are used for the import. When using the -e flag along with the resolution=value parameter, the region extents will be based on new dataset. It is therefore recommended to first use the -s flag to get the extents of the LiDAR point cloud to be imported, then adjust the current region extent and resolution accordingly, and only then proceed with the actual import. Another option is to automatically set the region extents based on the LAS dataset itself along with the desired raster resolution. See below for details. 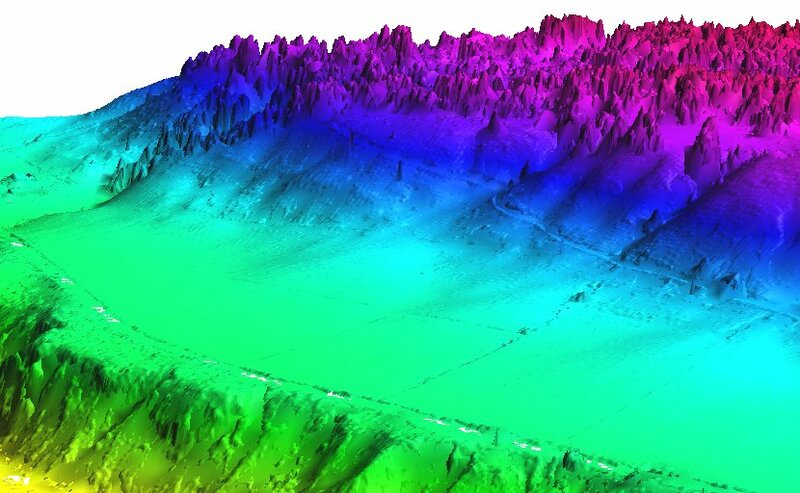 r.in.lidar is designed for processing massive point cloud datasets, for example raw LiDAR or sidescan sonar swath data. It has been tested with large datasets (see below for memory management notes). Since the r.in.lidar generates a raster map through binning from the original LiDAR points, the target computational region extent and resolution have to be determined. A typical workflow would involve the examination of the LAS data's associated documentation or the scan of the LAS data file with r.in.lidar's -s (or -g) flag to find the input data's bounds. Another option is to automatically set the region extents based on the LAS dataset extent (-e flag) along with the desired raster resolution using the resolution parameter. While the input file can be arbitrarily large, r.in.lidar will use a large amount of system memory (RAM) for large raster regions (> 10000x10000 pixels). If the module refuses to start complaining that there isn't enough memory, use the percent parameter to run the module in several passes. In addition using a less precise map format (CELL [integer] or FCELL [floating point]) will use less memory than a DCELL [double precision floating point] output map. Methods such as n, min, max, sum will also use less memory, while stddev, variance, and coeff_var will use more. The aggregate functions median, percentile, skewness and trimmed mean will use even more memory and may not be appropriate for use with arbitrarily large input files. The default map type=FCELL is intended as compromise between preserving data precision and limiting system resource consumption. Using the -s scan flag, the extent of the input data (and thus point density) is printed. To check this is recommended before performing the full import. The -g shell style flag prints the extent suitable as command line parameters for g.region. A simpler option is to automatically set the region extents based on the LAS dataset (-e flag) along with the target raster resolution using the resolution parameter. Also here it is recommended to verify and optimize the resulting region settings with g.region prior to importing the dataset. In varied terrain the user may find that min maps make for a good noise filter as most LIDAR noise is from premature hits. The min map may also be useful to find the underlying topography in a forested or urban environment if the cells are oversampled. Serpent Mound dataset: This example is analogous to the example used in the GRASS wiki page for importing LAS as raster DEM. r.in.lidar -p input="Serpent Mound Model LAS Data.las"
r.in.lidar -sg input="Serpent Mound Model LAS Data.las"